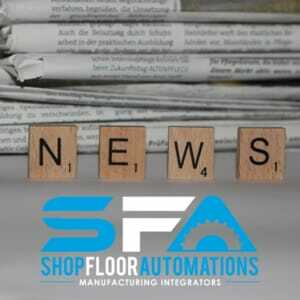 This archived copy of the January/February 2018 issue of the SFA newsletter focuses on machine monitoring data. A good number of our customers were able to contribute to the phenomenal growth in the manufacturing industry last year because of OEE information gathered by machine monitoring software. Often the first overlooked step in improved production is not properly tracking utilization and OEE. Our customers at R&D Manco in Phoenix definitely agree with this statement. We spoke to them recently and discovered that before implementing Predator MDC software, it was assumed that their machines were running at 50 percent utilization. Within a short period of time using the software, they found utilization was more around 30 percent. Uptime is critical to their operations, especially with lead times of 8 months to 1 year for the parts they run. In a recent issue of Modern Machine Shop (MMS), the company credits machine monitoring from SFA (via Predator MDC) as an essential resource for increasing capacity. There is no doubt that 2017 was a fruitful year for manufacturing in America. Confidence in our industry, as well as positivity in future prosperity, is at an all-time high. There are some concerns going forward to keep the momentum going in 2018. Industry 4.0, IIoT and automation are some of the concerns that we address. Check out our 2017 Review for USA manufacturing & an optimistic outlook on 2018! If you have an Okuma machine with a floppy drive that is about to bite the dust, the time to upgrade is now. Even if your floppy drive is still functioning, floppy disk technology has been outdated for about a decade and it is best to adapt to new technology now before the worst happens. Best to be prepared than be stuck with a dead floppy drive on your machine. The best part is that when you send back your old floppy disk drive core from the Okuma within 15 days, we will give you a $695 credit! Get in touch with our sales department by calling (877) 611-5825 or fill out a request for information.